When a picture mount is ordered using Mount designer, all sizes are cut exactly as you enter. Unless you are certain of the exact opening you require, a good idea is to minus ( deduct ) 8mm from the size of your picture so the opening when cut, sits 4mm over all around the picture. The reason for this is If you have a picture that is printed on paper which measures exactly 100mm x 100mm & you enter an opening to be cut into the mount of 100mm x 100mm, the picture will fall through the opening. There are only two measurements required to order a picture mount using standard or custom mount designer. 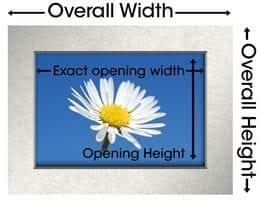 Measure the exact width and height of your picture. If required as explained above, subtract 8mm from each dimension. Step 2: Determine the Overall size you require. the Overall size of mount you require would be 8″ x 10″. This is worked out by adding the opening and the border widths together. the overall size of mount you require would be 400mm x 500mm.